v, 25 p. : ; 24 cm. at the last moment prevented most of us from leaving Washington. ment and the gracious hospitality extended by Queen Margrethe II. apologies to our friends in Denmark. to the 21st North Atlantic Assemb7y mee.ting. from the United States Congress. Members of the Senate named to the delegation on September 9.
diana; Thomas F. Eagleton, Democrat. Missouri: John V. Tiunev. were compelled to remain in Washington. Senator Griffin. however. the Danish Parliament buildinQ-. the Folketing) in Copenhagen. reconcile and consolidate the texts presented by the various committees. were received by Queen Margrethe II of Denmark and Prince Henrik. James Schlesinger, followed by a question-and-answer session. dent for a second consecutive term. Treasurer: Mr. Paul Langlois. Canada. Rapporteur : Mr. Gerhard Flamig, FRG. General Rapporteur Lord Lvell, United Kingdom. Rapporteur" Mr. Ruggero Orlando, Italy. Chairman: Mr. Klaas de Vries, Netherlands (First Chamber). Special Rapporteur to monitor MBFR" Mr. Rembert van Delden. Subcovinitte( oh Europ(o), DeaT i.se operationo. Rapporteur: General Joop van Elsen. Netherlands. Rapporteur Mr. Adriaan Ploeg. Netherlands. Vice Chairman: Mr. Phillip Burton. United States. General Rapporteur: Mr. Pieter T)anlk(rt Netherlands. Rapporteur: Mr. Paul de les. Bel1ium. Chairman: Mr. Erik B. Blumenfeld, FRG. no expenditures of appropriated funds under Public Law 84-689. 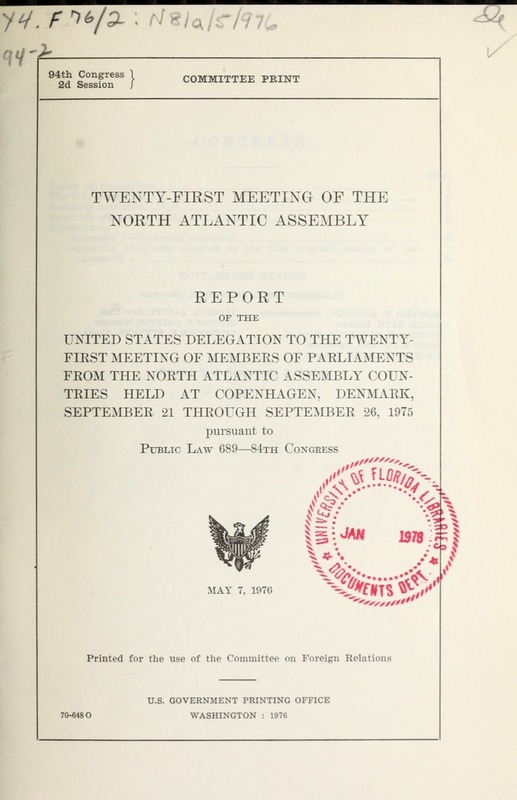 Assembly, held at Copenhagen, September 21 to 26, 1975.
cutively in its respective category and in the order of its adoption. the first Resolution is number 30.
recession and its social consequences. (1) Presented by the Economic Committee. tions Section into areas more directly concerned with education. (1) Presented by the Military Committee. recent developments in advanced weapon technology. and operation of such a system. on Education, Cultural Affairs and Information. the losses over the last five years. (1) Presented by the Scientific and Technical Committee. the results it has achieved. logy transfer and easier access to capital markets. mittee and the Scientific and Technical Committee. base essential for future European projects. present arms embargo on Turkey. (2) Presented by the Political Committee. in free elections to the vote of the Portuguese people. (1) Presented by the Political Committee. contribute their due share to the stabilisation of the situation. urgently a solution to the problem of the refugees. attention to these problems than hitherto. and radioactive waste, and necessary security precautions.